You may have used potatoes in an assortment of fondue dippers, but they can be served on their own with a pot of warm, dripping cheese. 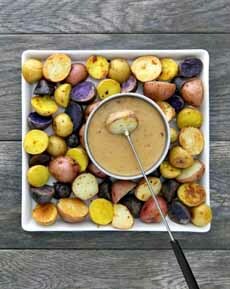 Try potato fondue as a first course at dinner (photo #1), or a light main course with an added protein dipper (ham, sausage or turkey chunks) and a salad. We adopted this recipe from one by Mary Giuliani, sent to us by Potatoes USA, a potato marketing and research organization that represents more than 2,500 potato growers and handlers nationwide. You’ll find hundreds of interesting potato recipes at PotatoGoodness.com. Used tricolor (white, red, purple) bite-size baby/petite/new/creamer* potatoes instead of the standard tricolor potatoes cut into chunks, specified in the original recipe (photo #2). Added roasted onions for a more diverse dish (photo #3). Used an IPA instead of the original stout. Turned it into a main dish by including sausage with the potatoes and onions (we used Applegate Organic Chicken & Apple Sausage). *Like miniature vegetables, baby potatoes are harvested before they’re full-grown. This makes them pricier, but with so much more eye appeal! They are available in white, red and purple varieties and are often sold as a mix. Baby potatoes are variously called creamer, new or petite potatoes. †The original recipe called for 1 cup of russet, 1 cup of purple and 1 cup of fingerling potatoes, cut into cubes. ‡You can use any cheese that melts well. Emmentaler, fontina, gouda, havarti, Monterey jack, provolone, raclette, reblochon and taleggio are also good melters. You can also blend two or three cheeses together for more complex flavors. Yummy potato fondue (photo courtesy U.S. Potato Board). The original recipe used cut-up potatoes. 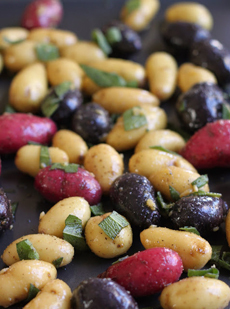 We substituted baby potatoes (photo courtesy Cilantropist). 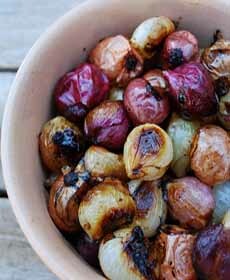 We added roasted pearl onions (photo courtesy The Cutting Edge Of Ordinary). 1. PREHEAT the oven to 350°F. If you are using fresh onions, soak them in warm water for 5 minutes before trimming the ends and removing the skins. 2. TOSS the potatoes and onions in a bowl with olive oil, minced garlic, salt and pepper. Place them in a roasting pan and roast for 30 minutes, or until brown and crisp. Stir several times during cooking and rotate the pan halfway through, for more even cooking. If roasting the onions and potatoes together, keep them on separate sides of the pan in case you have to remove the onions a few minutes earlier. The onions should be al dente. If they get soft, they won’t stay on the fondue forks. Ditto with the potatoes: yielding to the fork, but not soft. 3. COMBINE the beer, half-and-half, flour and mustard powder in a medium saucepan. Warm the liquid over medium heat and begin adding the cheese, whisking until melted. 4. REMOVE from the heat and add the pepper, salt and nutmeg. Place the pot back on the stove and cook while stirring to a smooth consistency. Add more beer if the fondue is too thick; add more cheese if it’s too thin. 5. TRANSFER the mixture to a fondue pot and stand fitted with Sterno or a votive candle (Sterno will keep it hotter, longer). Stir in the bacon. Serve with roasted potatoes. To keep the fondue at its ideal consistency, stir it intermittently.